This letter provides you with our official notification that we will be filing our initiative tomorrow at 12 noon and we will work very hard over the coming weeks and months to collect enough signatures – at least 3880 valid ones – on petitions for Bellingham Initiative No. 2011-01 to ensure a reconsideration of Ordinance #2010-12-064 concerning automatic ticketing cameras. We are targeting the May ballot. Protects democracy and due process. 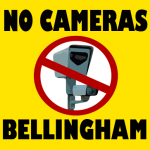 The language of the petition is clear: We, the undersigned registered voters of the City of Bellingham … respectfully petition the City Council to enact said proposed measure into law; furthermore, if the City Council fails to enact this measure that it be submitted to a vote of the people …. Please notify us immediately by telephone at 817-713-6880 if there are any additional actions we are required to take followed by a letter providing that information. If you have any questions, please call.